The FDA Center for Devices and Radiological Health (CDRH) has proposed a reorganization that will collapse the Center’s seven offices into four, combining siloes of expertise into a new office that aligns talent into teams by product type and technology. Individuals from the evaluation and compliance groups for specific product types and technologies will be on one team, creating a new review and inspection dynamic. 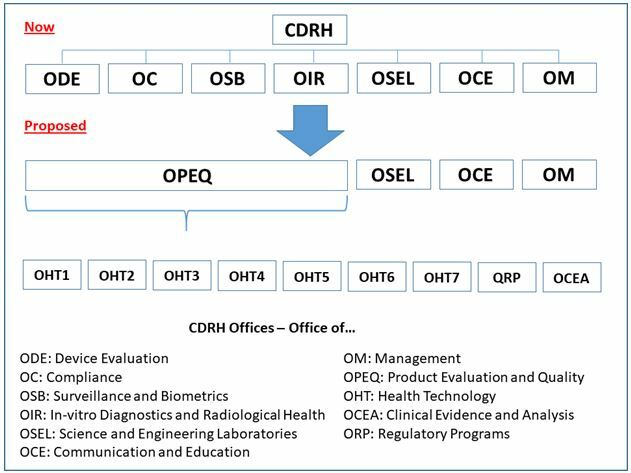 The proposed CDRH Office of Product Evaluation and Quality (OPEQ) will comprise several Office of Health Technology (OHT) teams. Each technology-specific team will focus combined expertise from the evaluation, compliance, surveillance, and radiological health offices to streamline the performance of regulatory reviews, as well as improve communications. At a Xavier Health web conference in February, Half Day with FDA — The Future: Alignment and Reliance, CDRH Office of Compliance Regulatory Affairs Deputy Director Capt. Sean Boyd presented the reorganization plan and the reasons for its proposal. The plan has been submitted for agency review, and its approval and implementation is anticipated by the end of 2018. He explained that the effort began a decade ago with CDRH’s Office of In vitro Diagnostics (OID). That office, employing a similar reorganization model as the current proposal, evolved to become the Office of In vitro Diagnostics and Radiological Health (OIR) about five years ago. Within OPEQ, there will be seven Offices of Health Technology (OHTs) “that are aligned in much the way that our pre-market divisions are organized in ODE today,” Boyd continued. Each office will be responsible for pre-market review, compliance and enforcement, and surveillance functions for specific types of medical devices. For example, people who today handle pre-market reviews on cardiovascular devices, compliance and enforcement reviews related to cardiovascular devices, or surveillance related to cardiovascular devices, all will be combined into one OHT under the new organizational structure — likewise for other device areas, or groupings of device areas. Within each OHT, there will be further breakdowns along more specific technology lines. Also, in addition to individual expertise in various functions, each team may include people familiar with all of those functions — for example, a generalized reviewer who can operate in all of those functional areas. In addition to the OHTs, OPEQ will contain two offices charged with management of the regulatory programs: the Office of Regulatory Programs (ORP) and the Office of Clinical Evidence and Analysis (OCEA). These offices will be responsible for development of policies, programs, and processes implemented within the OHTs. Boyd said he does not expect to see immediate effects following the reorganization but, over time, the vision is for the OHTs to provide device manufacturers with a “one-stop shop” for regulatory and compliance information. understanding some of the clinical assessments performed to prove that the device is ready to come to market. TPLC database is refreshed as each of the individual data sources is updated, and it can be searched by device name or product code to receive a full report about a particular product line. In its current form, the TPLC database provides data by product code (procode), or generic category of device, and not by individual submission or brand name. A list of information sources that feed into the database is available here. 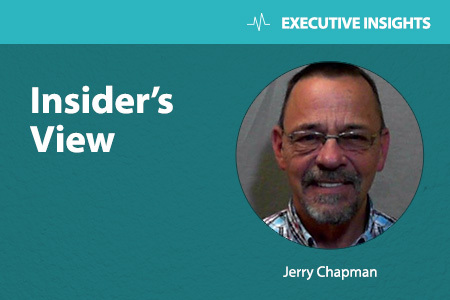 Jerry Chapman is a GMP consultant with nearly 40 years of experience in the pharmaceutical industry. His experience includes numerous positions in development, manufacturing, and quality, at the plant, site, and corporate levels. He designed and implemented a comprehensive “GMP Intelligence” process at Eli Lilly and again as a consultant at a top-five animal health firm. Jerry served as Senior Editor at International Pharmaceutical Quality (IPQ) for six years, producing in-depth reports of interest to industry and regulators in the drug GMP/CMC space. Email Jerry here, visit his website here, or connect with him on LinkedIn here.